This last Tuesday’s episode of ABC’s Agents of SHIELD saw that show drop yet again in the ratings, this time to a 2.2 score in the 18-49 demographic with 6.7 million total viewers. That’s a notable drop from the show’s 2.5 score the prior week and also a low point for the freshman series. And this occurred right after Thor: The Dark World hit the theaters which I’m sure was expected to give SHIELD a boost. I said last previously that a 2.5 rating was probably the lowest acceptable level for the show before ABC executives would step in and start damage control for what was expected to be a surefire hit this season. SHIELD actually started out that way with its premiere drawing a huge 4.7 score in the overnights, but it has been on a steady decline since then and has now sunk to less than half its debut rating. I discussed the show’s ratings decline in a post earlier this week, and that generated some interesting discussion over at the Sci Fi Scroll that indicates fans had high expectations for the show, but have been unhappy with its direction. This all reminds me very much of Terra Nova from two seasons ago that arrived with high hopes but managed to completely miss the mark and generated more irate discussions on the social networks about the show’s failings than it did ratings. 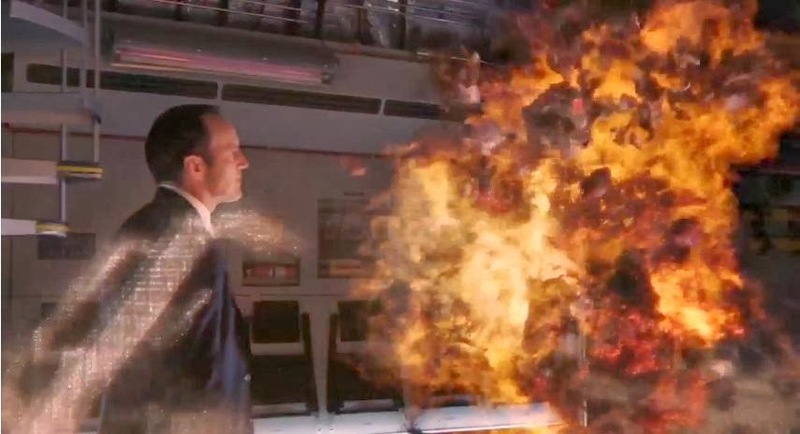 Personally, I think Agents of SHIELD is head and heals above the tepid, hackneyed Terra Nova, but I do agree that it seems to be losing its way after a promising start. I still don’t believe the show is in serious danger of cancellation yet and ABC did give it a full season order. But I believe they will demand a course change at mid-season and how it performs later in the season will dictate its fate. We have seen the death spiral claim shows like V, FlashForward, The Event and the aforementioned Terra Nova in recent seasons and currently it looks like SHIELD is on that same path. Maybe a course correction will help it, but currently the show’s future is not nearly as bright as right after it debuted in September. The word is much better for the CW shows that air on Tuesdays as both The Originals and Supernatural rebounded from last week’s dips and delivered decent numbers for the fifth place network. Both shows pulled a 1.1 rating in the 18-49 demo with right at 2.4 million total viewers each. These shows have allowed The CW to re-stake a (small) claim to Tuesday nights despite heavy competition and the may try a similar approach on Mondays starting in January with the mid-season genre entries The 100 and Star-Crossed (more on them at this link). And at the 10 PM EST hour, CBS series Person of Interest improved its numbers to a 2.0 rating with 12.6 million total viewers. It did not have to contend with a two hour The Voice running into its timeslot this week. On Wednesday, NBC’s Revolution actually improved its numbers (after the finals came in) to a 1.5 rating in the 18-49 demo with 5.2 million total viewers. This numbers will probably keep it going through its full season order since their spin department keeps touting that they are doing better on this night compared to last year and that Revolution is doing well in the coveted men 18-34 demographic. But I have a hard time seeing the network greenlighting a third season unless this show sees a notable upswing. Over on The CW, Arrow had its best numbers of the season with a 1.2 rating and 3.1 million total viewers. That show’s strategy of bringing in familiar faces from the DC Universe (the Flash is on the way) seems to be working well as it is building up its second season audience (take note, Agents of SHIELD). The Tomorrow People, though, continues to ride at a lower level, pulling another 0.6 score with 1.7 million total viewers. That show did get a full season pickup, so it needs to focus on building back up the numbers it had early on if it wants to see a second season. At the 10 PM EST hour, American Horror Story: Coven edged up to a 2.3 rating with 4.2 million total viewers. It easily won the night among cable shows and beat out about half of the schedule of the Big Four broadcast networks (including Revolution) and it continues to be a force for the emerging cable networks.